Velvet Paw Creations: "Love Me Love My Cat" ATC - Valentine's Week at Lost Coast Portal to Creativity! 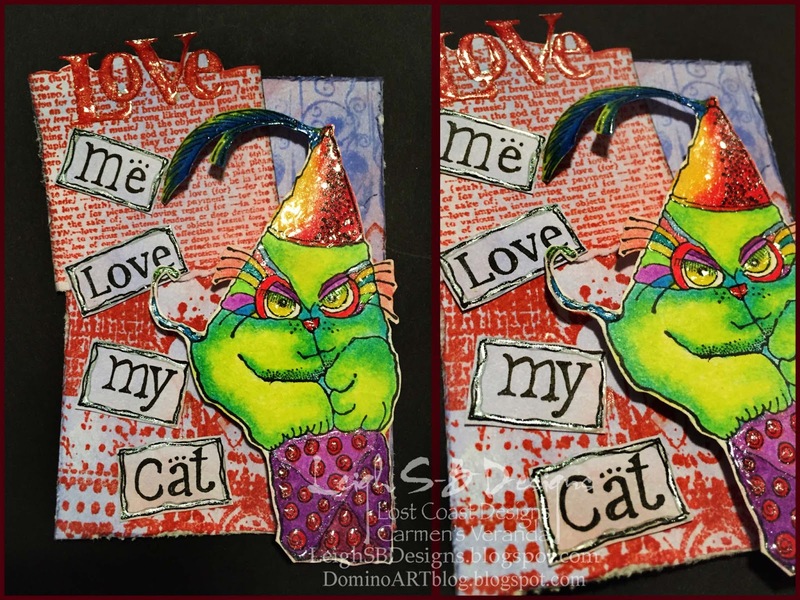 "Love Me Love My Cat" ATC - Valentine's Week at Lost Coast Portal to Creativity! Featuring Lost Coast Designs stamps - Cracked Party Cat, Grunge Border 2" "Love" Misc Worlds, Love Dictionary, Hearts and Curls border and Hearts border. I stamped the ATC background with Fired Brick and Shaded Lilac Distress Ink, the "Love" word and the cracked kitty cat in black Memento Ink and coloured with PrismaColor pencils with some metallic gold details. The words "Me, My and Cat" I handwrote with a black Micron pen. Kitty was fussy cut out and adhered to the ATC with pop dots. The words, the dictionary LOVE and the kitty are embellished with Vive Pearl Magic Transparent White pen for lots of yummy dimension and sparkle. I'm going to share my other projects in separate posts so I hope you'll stop by to see them and also pop over to the Portal and join us for Valentine's Week! I'm entering this kitty cat over at SUYP for challenge # 3! Love these ATC's and these little critters! Very funky creation. Really catches the eye.